Now you do not have to hang out with her with the necessary documents everytime . The government has launched a digital locker where birth certificates, passports, important documents, such as academic certificates online store. Just to get this feature you must have the base card. Based on the number of feeds you can open the Digital Locker account. The special thing is that once the facility locker after uploading your documents anywhere you would not need to pay the original copy of your certificate. It would be enough to link to your digital locker. Digital Locker, an integral part of the Digital India program. Department of Electronics and Information Technology on Tuesday launched a beta version of the digital locker. DigiLocker is your online repository of important documents like certificates, degrees etc. which are frequently required while availing any service. DigiLocker will allow you to securely upload and share your documents anytime, anywhere to authorised users/agencies. The issuer departments will also be able to automatically push the link of your document kept in their repositories. 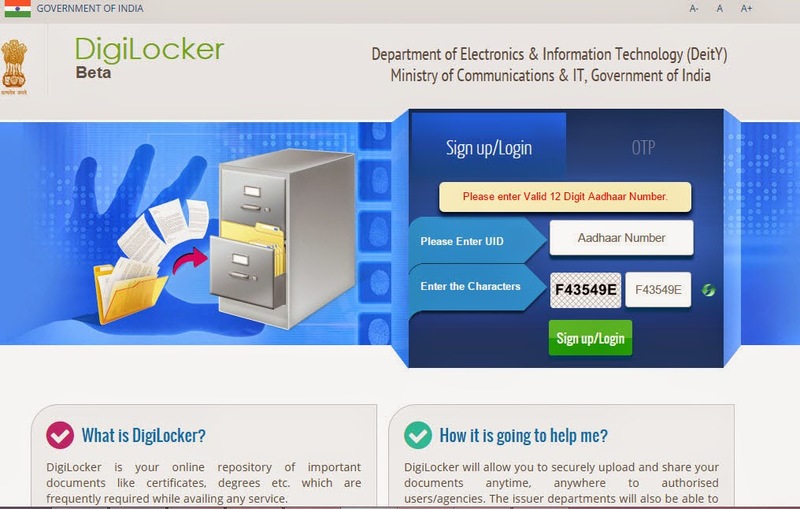 To Sign up your digital locker visit website Http://digitallocker.gov.in/ you go to open the digital locker to create your ID . Id make you need to login to your base card number . After login you will be asked which Information complete it . Then, your account will become . After opening the account , you will be able to upload any documents on your personal .